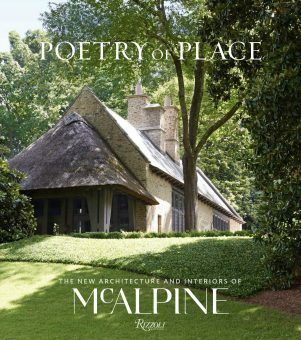 We are gearing up for next week’s release of our new book, Poetry of Place, the New Architecture and Interiors of McALPINE – and we will soon be on the road again. Below is our 2017-2018 book tour schedule of launch parties, lectures, book signings and events. New events will be added and you can always see the latest updated tour schedule here (PDF). We sincerely hope to see you soon! 351 Peachtree Hills Avenue NE, Suite 325, Atlanta, GA, 404-501-3200, Cocktails & book signing. Sponsored by Atlanta Homes & Lifestyles. Book sales provided by A Cappella Books. Suites at Market Square Seminar Room (SAMS 1-1014), High Point, NC , Sponsored by FLOWER Magazine “Stories behind the Design”, Panelists: Bobby McAlpine, Christopher Spitzmiller, Suzanne Rheinstein & Tammy Connor. Book signing to follow at LEE Showroom. 2831 Culver Road, Birmingham, AL, 205-868-9199, Book signing with Bobby McAlpine. 2321 Crescent Avenue, Charlotte, NC, 704-332-1668, Book signing with Bobby McAlpine. The Cigar Factory, 701 East Bay Street, #106, Charleston, SC, 843-207-4804, Book signing with Bobby McAlpine. 649 Meeting Street, Charleston, SC, 843-577-5245, Lecture by Bobby McAlpine. 32 South Section St, Fairhope, AL, 251-928-5295, A Talk with John Sease & book signing. 316 Royal Street in the French Quarter, New Orleans, LA, 504-552-4311, Holiday event & book signing with Bobby McAlpine. George R. Brown Convention Center, 1001 Avenida de Las Americas, Houston, TX, Panel discussion with Bobby McAlpine, Susan Ferrier, David Baker & Ray Booth moderated by Margot Shaw, Editor in Chief of FLOWER Magazine. The Fairgrounds, 2057 Georgia Highway 122, Thomasville, GA, 229-226-6121, Keynote Lecture by Bobby McAlpine & Book Signing.